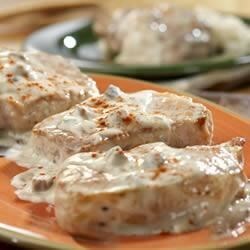 "A star is born when a favorite herbed salad dressing mix gives new life to this classic mushroom-sauced pork chop skillet. It's easy and your family will love it served with ranch-flavored rice." Add soup, milk and 1/2 package salad dressing mix. Heat to a boil. Cover and cook over low heat 10 minutes or until done. Sprinkle with paprika. Ranch-Style Rice: Add remaining salad dressing mix to water when making rice. My family of seven loved this! We used a rice cooker and everything turned out fabulous. Great flavor. I never would have thought of this one. Thanks!